“Strawberry Fields Forever” — what inspired the illusive lyrics to one of John Lennon’s most masterful songs, penned in the 1960s? Nothing, really, for according to the words, “nothing is real.” That hasn’t dissuaded millions, perhaps over a billion, people to try decoding the music hoping to shed light on life’s discordance. But does the meaning, in the end, really matter? That’s the point of the song — right? Existentialism makes me hungry. Inspired by the music, I crave — rather, am “hung about” — sweet, fresh-off-the vine strawberries, so I e-mailed Rowe’s Farm inquiring as to when their strawberries were ready for picking. I was hoping they’d reply with a definite time so I could put “Pick Strawberries” on my calendar; I can be flexible a day or two. I received the following response: “Sometime in June. You will be notified.” Two sentences on which I can hang my hat; frank pragmatism, the date ambiguous, but to the point. As the sun rises and sets, order in the world is restored. The picking season of strawberries in our local fields is not subject for debate. It is determined by the vagaries of nature, and the time for plucking the sweet rubies from their vine is finite. Accordingly, there’s no pre-set hours for picking strawberries at near-by you-pick farms; when the farms advise their crops are ready, it’s best not to tarry and get picking, figuring as many ways as possible to integrate them into your menus. Certainly savoring the berries au natural is the way the powers intended, but I’m not one to leave well enough alone. They’re so lovely laid upon short cake topped with frothy whipped cream, or tossed with a bit of sugar and spooned over pound cake. And of course there’s the pairing with balsamic vinegar, which to some is yesterday’s news — as familiar as peaches and cream. But this combination may not necessarily be pleasing. The first time someone served me strawberries drizzled with balsamic vinegar, my palate was indignant. The strawberries were firm, pinkish, sour things and I’m pretty sure what they called balsamic vinegar was a sugary concoction manufactured in a New Jersey factory. I feigned a smile, but it was a brassy, puckered-up eating experience at best. To achieve the balsamic-strawberry complexity of bliss, you need a top-drawer balsamic vinegar — inky, syrupy, pungent and sweet — and lush ripe strawberries, as fresh as you can find. This synergy imparts a richness to the sweet, with a fine earthy finish. Try balsamic strawberries over crostini smeared with goat cheese; in a caprese salad substituting strawberries for the tomatoes, or spooned over grilled salmon or chicken. Zingerman’s stocks many superb balsamics, one of which, Vecchia Dispensa’s 10 Year Aged Balsamic (250 ml; $35.00), their website describes as having “…rich flavors of oak, blackberry and dark fruit”. Fustini’s sells an 18 year old balsamic vinegar (375 ml; 17.95) that’s a terrific bang for the buck. All of these vinegars are available for sampling. To have a plethora of superior balsamics a block from each other? Squint your eyes and Kerrytown’s bell tower could be topping a cathedral in Modena. The following recipe was inspired by a recipe I saw on the fineCooking.com website. Grilling the strawberries lends another layer of complexity, adding juiciness and smoke, especially if grilling over charcoal or hard wood. I wish I could report the pictured strawberries were from a local farm but at this writing, I settled for lush ripe beauties from California. Meanwhile I await the e-mail from Rowe’s Farm, ready to drop everything, grab a basket and explode into my car. If I put off picking these temporal berries of bliss even a day, the season may be kaput. Perhaps the message I glean from Lennon’s round-about brilliancy is to seize the moment, carpe diem: life’s ephemeral, a sun-kissed dream. Place vinegar in a saucepan, reduce the vinegar at a gentle boil until slightly syrupy, 2-4 minutes (the vinegar will continue to thicken as is sits). Set aside. 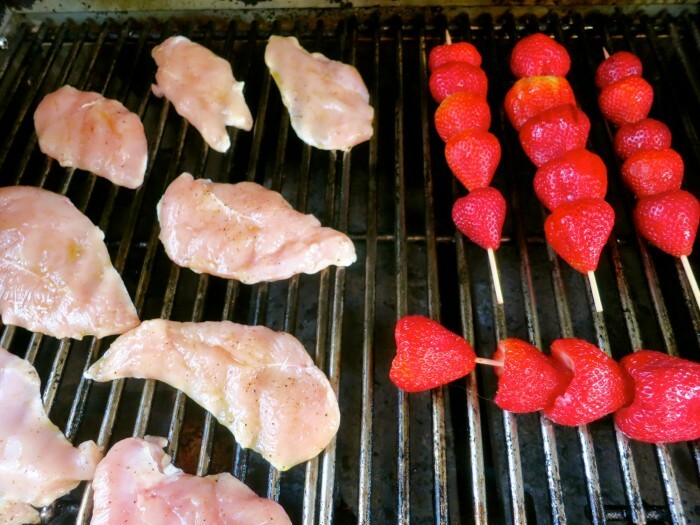 Preheat gas or charcoal grill to medium-high heat. Thread 5 strawberries on each of 4 skewers. Brush the chicken breast halves or cutlets with olive oil and season with kosher salt and freshly ground pepper. Serve drizzled with the reduced vinegar and sprinkled with basil. 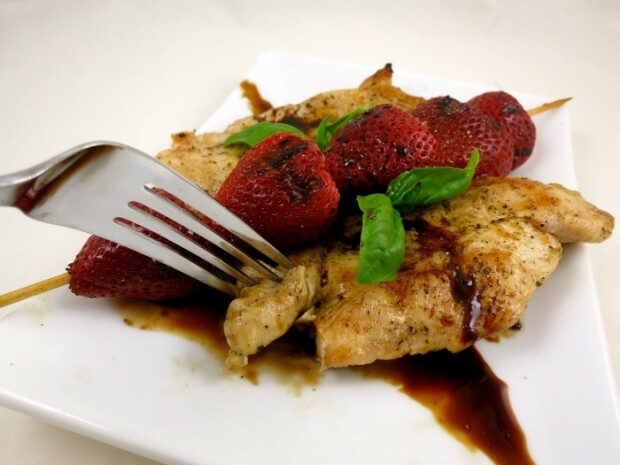 If the vinegar is too syrupy, reheat and whisk in a bit of balsamic vinegar to thin. *If using an expensive, top-drawer, well-aged balsamic vinegar, cut the amount of vinegar in half and only reduce a minute, or not at all. More Recipes Filed Under "Entrées"